دمیرلی, اِکرم. (1388). The Influence of Ibn Sìnå on Gadr ad-Dìn Qinawì and His Followers. دوفصلنامه جاویدان خرد, 06(13), 5-17. اِکرم دمیرلی. "The Influence of Ibn Sìnå on Gadr ad-Dìn Qinawì and His Followers". دوفصلنامه جاویدان خرد, 06, 13, 1388, 5-17. دمیرلی, اِکرم. (1388). 'The Influence of Ibn Sìnå on Gadr ad-Dìn Qinawì and His Followers', دوفصلنامه جاویدان خرد, 06(13), pp. 5-17. دمیرلی, اِکرم. The Influence of Ibn Sìnå on Gadr ad-Dìn Qinawì and His Followers. 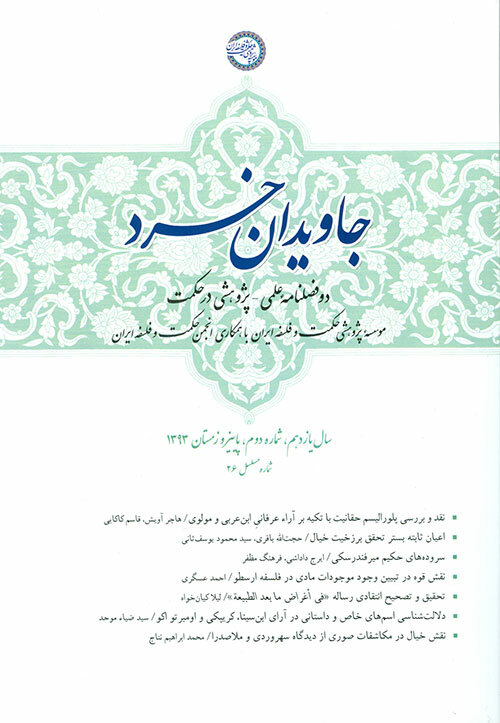 دوفصلنامه جاویدان خرد, 1388; 06(13): 5-17. This article is an investigation into the nature of the Sufi metaphysics of Gadr ad-Dìn Qinawì and his followers. In contrast to previous scholars, who have considered Qinawì to be dismissive of philosophy in a way similar to Ghazålì, the author shows that in fact philosophical metaphysics, and in particular the formulations of Ibn Sìnå, had a great impact on Qinawì and his followers in the school of Ibn ‘Arabì in their attempt to develop ‘ilm ilåhì (divine knowledge, i.e., metaphysics). Indeed, the influence of philosophical metaphysics is one of the crucial factors which distinguish the thought of this school from the earlier phase of theoretical Sufism. The article begins with an overview of the two important phases in the history of theoretical Sufism, the school of Ibn ‘Arabì being the second. Then the author considers how this second phase has been interpreted by traditional and contemporary scholars. Following this, in the main section of the article, the author analyses the metaphysics of Qinawì and indicates the way in which it was influenced by the philosophy of Ibn Sìnå.